Finding a new home to fit the needs of everyone in your family can be a bit of a challenge. But, have you considered the needs of your pet? According to a 2017-2018 survey published by the American Pet Products Association, 68 percent of U.S. households own a pet. That’s approximately 85 million families that own a dog, cat, another type of furry friend, or fish. Yes, pets come in all shapes and sizes. And, so do homes. When buying a new home it’s important to consider your pet especially if it has become an integral part of your family. Looking out for your pet’s best interests during the house hunting process will definitely make you happier in the end. And, theirs. After all, you have to coexist together. To find a home everyone will be happy in it’s important to remember that the home’s exterior is just as important as the interior. If you have never bought a new home as a pet owner, there’s a multitude of factors to consider. So, let’s take a look at some of those things to look for when buying a home that will keep your pet happy, healthy, and safe. Some communities are very pet-friendly while others fall short. So, to know if your pet is welcome review the community’s Homeowner’s Association (HOA) bylaws. To get a copy of the bylaws stop by the HOA office when you’re visiting the community. Depending on the community certain restrictions might apply such as the type of breed or animal and the number of pets that are allowed. Dogs, cats, and feathered friends such as birds are common household pets, but what about chickens? And, what about leashes. Do you need a leash for you dog in all common areas? In addition to verifying the rules with the HOA, it’s also essential to check out all local city ordinances pertaining to pets. Don’t forget to review any noise ordinances especially if you like to put your dog in the yard at night. Finding the right street for your home is key when you have kids and a pet. If your dog likes to make a mad dash for the door every time it opens, you’ll want to steer clear of high traffic streets and main thoroughfares. One of the safest place for a home in a master-planned community is on a cul-de-sac. These dead-end streets have limited access because there’s only one way in and one way out. They are especially ideal for homeowners that want to restrict the amount of traffic near their home. Be wary of your animal’s paws and claws on your floors. Though, you might not think so, solid hardwood flooring is highly recommended for homes that have pets. Because if they get scratched, they can be refinished. It’s best to select either very light or very dark colors. Reclaimed and distressed woods are also great choices. But, if solid hardwood flooring is out of your budget additional flooring options to choose from include tile, vinyl, and laminate. These days you can do wonders with tile. Since granite is a harder stone it’s a great choice for a floor in a home with pets. Ceramic and porcelain are also excellent choices. They are scratch resistant and come in hundreds of colors and styles including those that resemble both wood and marble. Wall-to-wall carpeting in a home with pets gets a big thumbs down from the experts. In today’s housing market open floor plans are all the rage. An open floor plan gives you a sense of space. And, lots of it. But, will it be enough? Consider the size and layout of your new home especially if you have a large dog or more than one. When deciding on the home’s layout, don’t forget to check convenient spaces that you can put a dog bed and water bowl or a litter box and a cat tree. Also, check for rooms with convenient outlets that can accommodate an aquarium if you own fish. Birds are social, so make sure there’s space in a room for your bird where the family likes to gather. Are there places in your neighborhood for your pet to play? In the big scheme of things the outdoor landscape of the community you are thinking of moving into is extremely important. When you go for a site visit, go outside, take a deep breathe, and look around. Are there sidewalks and trails and wide open spaces? These are all important elements for the overall health of both you and your dog. A great development will have both sidewalks and trails, and open spaces for all to roam. Depending on the type of pet you own and its size you’ll want to make sure the backyard is large enough. You’ll also want to have a fence. Backyard fences provide a safe haven for pets. Not only will they keep your pet from running off, fences also keep other animals out. If your developer doesn’t provide a fence as part of the package, you’ll most likely have to spend some extra cash to install one. Consulate with your HOA before you begin. There may be restrictions on the size, height, and allowable materials. Some developments only allow underground electric fences. So, be on the safe side and check with them first. If you are new to the Austin metro area, or are planning to move here and have a dog as your primary pet, you’re in luck. The city ranks #4 when it comes to pet friendly cities in the U.S. According to an article by dogtime.com, Austin has an abundance of pet photographers, dog specific food trucks, and restaurants that provide outdoor patios perfect for pooches and their owners. Dog parks abound both inside and outside of the city limits, and there’s trails a plenty including Brushy Creek Regional Trail in Cedar Park. The 6.75 trail is the perfect place to spend a Sunday afternoon walking your dog, running, cycling, or spending time with the family. And, then there’s Austin Doga. Ok, it’s exactly what it sounds like–yoga for you and your dog. Yea! Are you looking for a master-planned, pet-friendly community? Travisso’s got you covered. We offer state-of-the-art floor plans from award-winning premier builders. Homebuyers can choose homes ranging in size from 1,900 to over 5,000 square feet with prices starting in the 300s. And, there’s much more including resort style amenities, over 10 miles of proposed walking and biking trails, and a future 58 acre on-site regional park perfect for your active lifestyle. 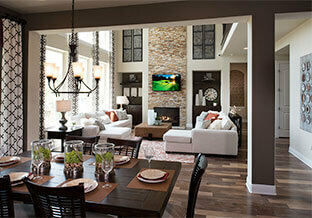 Visit us in Leander today and explore our new model homes and neighborhoods. For additional information call us at 512-243-8583.